The term nesidioblastosis was originally coined by Laidlaw in 1938, who described it as neodifferentiation of Islets of Langerhans More Details from pancreatic ductal epithelium. The majority of cases have been documented in infants and children, with few cases seen in adults. Nesidioblastosis is characterized by severe recurrent hypoglycemia with hyperinsulinemia requiring intravenous glucose administration and inappropriately low plasma level of ketone bodies and free fatty acids. We report a rare case of nesidioblastosis in a 20-day-old female infant who presented with persistent hypoglycemia and seizures. A 20-day-old female infant born to a nondiabetic mother presented with tremors culminating in tonic-clonic seizures. On evaluation, the blood glucose levels were persistently low despite the patient being on IV glucose drip at the rate of 12 mg/kg/min (serial serum glucose levels were between 30 and 40 mg/dl) and insulin levels were elevated (insulin level was 17 μU/ml) . Insulin-to-glucose ratio was 2.0 (normal < 0.3). Cortisol and growth hormone levels were within normal range. Urinary ketones, amino acids, and reducing-substances were within the reference range. Ultrasonography and magnetic resonance imaging (MRI) were inconclusive. Gallium 68 octreotide scan did not demonstrate any evidence of increased uptake by the pancreas. There was no response to treatment with octreotide and diazoxide. A 95% pancreatectomy was performed. Gross examination of the resected pancreas did not reveal any mass lesion. 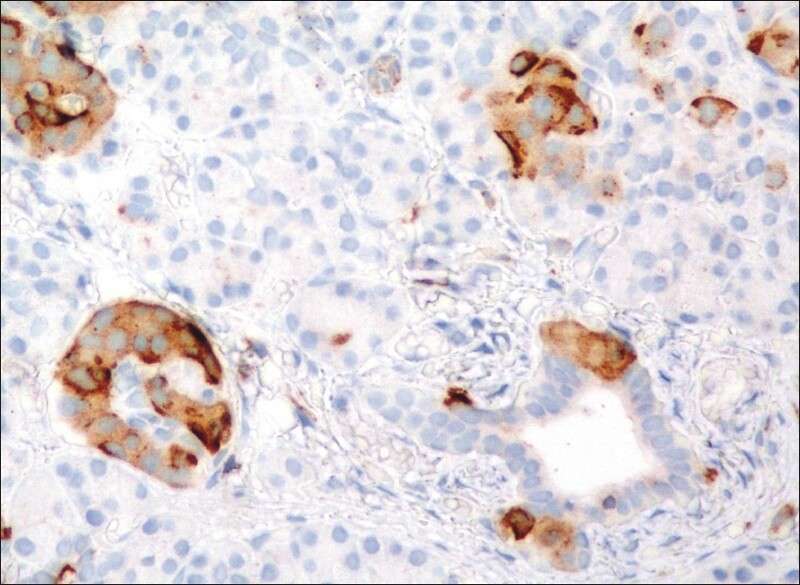 Histopathological examination showed alteration of the endocrine component in the form of hyperplasia of the islets. 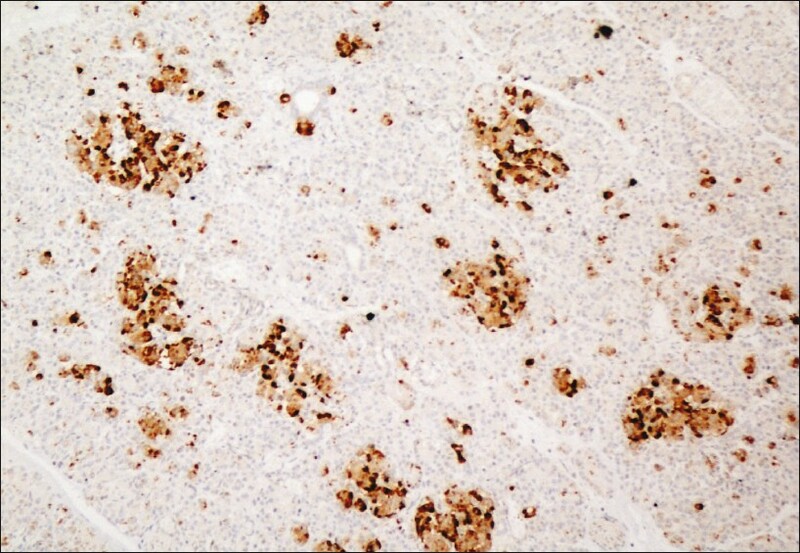 Small nests of pale-staining islet cells of variable shapes and sizes were present diffusely throughout the pancreatic parenchyma and interlobular septae and were also seen individually intermingled with the denser-staining acinar cells [Figure 1] and highlighted on immunohistochemistry with neuron-specific enolase and chromogranin [Figure 2] and [Figure 3]. Considering all gross, histopathological, and immunohistochemical findings, a diagnosis of diffuse form of nesidioblastosis was made. In infants, the estimated annual incidence of nesidioblastosis is 1 in 50,000 births for the sporadic form, but may be as high as 1 in 2500 births in societies with high rates of consanguinity. 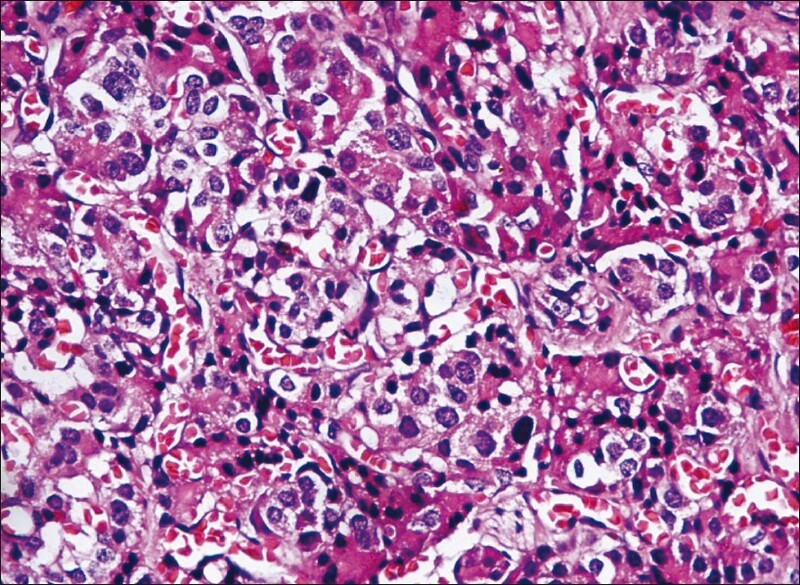 On histopathology, it is classified into focal and diffuse types, the distinction between the two forms is important because infants suffering from focal form can be cured by very limited pancreatectomy, while patients of diffuse form are at risk of recurrent hypoglycemia even after near total pancreatectomy. The differential diagnosis of this entity includes insulinoma, which shows presence of a mass lesion on imaging, and islet cell hyperplasia, which is characterized by the presence of increased confluent accumulation of abnormally large islets in the center of lobules but does not show ductuloinsular complexes typical of nesidioblastosis. Hence, nesidioblastosis should be considered in differential diagnosis of neonatal hypoglycemia, diagnosis of which is difficult to be established by routine laboratory and radiological procedures and requires histopathological examination of the pancreatic tissue to differentiate it from other pathological lesions such as insulinoma and allow distinction into focal and diffuse types. Dr. Meenu Pujani- provided technical help in editing of the manuscript. 1. Laidlaw GF. Nesidioblastoma, the islet cell tumor of the pancreas. Am J Pathol 1938;14:125-34. 2. Kaczirek K, Niederle B. Nesidioblastosis: An old term and a new understanding. World J Surg 2004;28:1227-30. 3. Sempoux C, Guiot Y, Jaubert F, Rahier J. Focal and diffuse forms of congenital hyperinsulinism: The keys for differential diagnosis. Endocr Pathol 2004;15:241-6.